As the last snowflakes of spring swirl outside the window, we again open our hearts and thank you for your prayers, your encouragement and your financial support. By the time you receive this, the tundra will just be turning green for the brief summer, which can be as short as seven weeks. For us, this renewal of life is a special reminder of God’s Love, which we work so hard to bring to the dozens of isolated villages which we serve. Thank you so much for your help! Dean is enthusiastic about pursuing broad-casting as his life’s work, though he allows that being a movie star is another possibility. top “WATER SKY”: In late spring, snow on the ground and shorefast ice reflect sunlight and brighten the sky, while offshore, the open water of the Bering Sea absorbs light. The result is that, on cloudy days, the sky above the ocean appears extremely dark. As the snow melts very slowly in spring, the thrilling optical phenomenon can appear for many weeks. On the air since 1971, KNOM is the oldest Catholic radio station in North America. We beam the Mass, the Rosary, homilies and thousands of inspirational spots through this far-flung region. 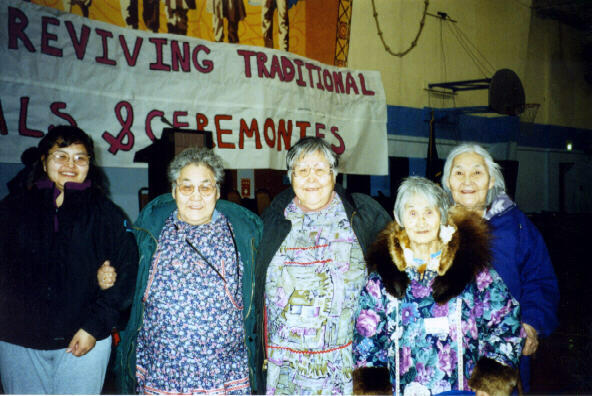 We are also on the air to educate, to inform, to combat this area’s many serious problems, to provide positive companionship, and to encourage pride in traditional Alaska Native cultures. Contributions by people like you provide 94.3% of our operating income. Thank you! 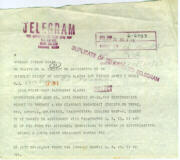 30 YEARS AGO: June 30, 1970, a telegram arrived at the office of Bishop Robert Whelan, SJ in Fairbanks. 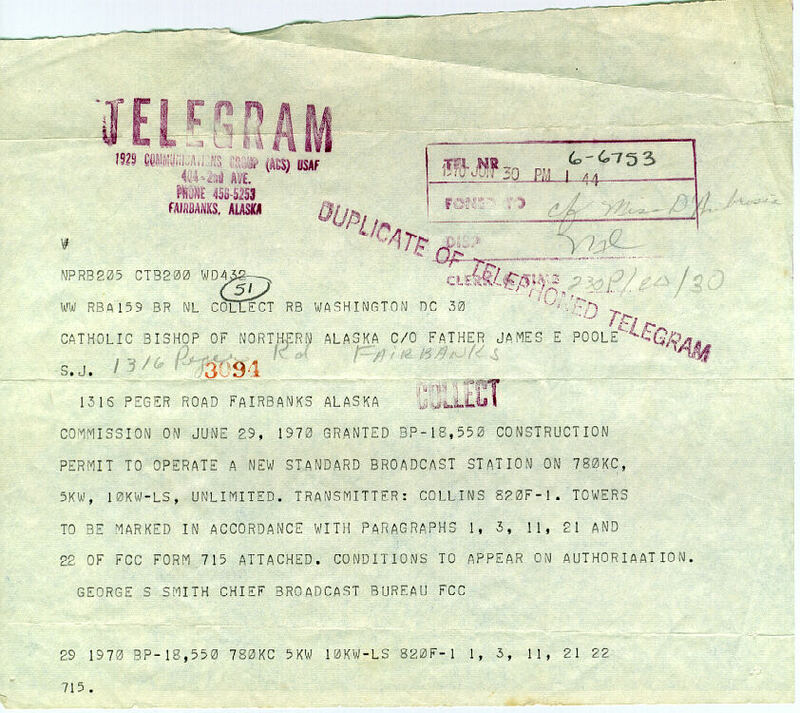 From the FCC, the telegram authorized construction of the new Catholic radio station in Nome. That allowed the volunteer crew to begin work on the station’s studio. Everyone whooped and yelled with joy. Management for the mission’s Right-of-Way for the remote transmitter site. As the short Alaska construction season was whizzing past, the volunteers were unable to do anything at the site, 3.3 miles east of Nome. To everyone’s dismay, it appeared that the new station was about to suffer another one-year delay. JUBILEE INSPIRATIONAL SPOT: Because God loves you...you can never stand alone. You can go beyond yourself. You can ask forgiveness of those you have hurt. You can care for the weak. You have the power to touch hearts with compassion. The power of God’s Love lies within you. top LIGHT SUBJECT: June 21st, Nome’s longest day, we enjoy 21 hours, 29 minutes of sunlight. On that day, the sun rises at 4:19 AM, and does not set until 1:48 AM the following day. The sky remains bright during the overnight. As we mentioned last month, Nome will not see a truly dark sky until September. The Midnight Sun allows for long work hours, and plenty of light during the summer’s short food gathering season. But try getting the kids to bed! 25,000 WATTS: The wheels turn slowly, but we continue toward the possibility of increasing our night-time power up to the 25,000 Watt daytime level, with the aid of consulting engineer Jack Mullaney and Alaska broadcast pioneer Augie Hiebert. GOT A MATCH? Many companies will match their employees’ contributions to KNOM. Because of our mission’s extensive work battling alcoholism, domestic violence, sexual assault and the many other social ills of this vast region, most companies which do not ordinarily support religious organizations will match gifts made to KNOM. A PRAYERFUL GOODBYE (left) to Matt Christy, who returned to Altoona, PA this month following a year of volunteer service. Matt’s duties included announcing the morning show and producing educational spots. He leaves with our good wishes and our prayers. Please join us in prayer for this young man as he enters a new phase of life. Encourage them each day to do their best. Strengthen them in times of difficulty. Help them be generous, and mindful of the needs of others, caring towards elders. and educational spots, Eskimo and Indian stories and a new series of Rosary presentations. editing station for the upstairs office. It will be used to edit spots and programs that have been recorded in the main studios. It will include two computers, an audio mixing console, compact disc and cassette tape players, professional headphones, a backup power supply, and a sturdy, productive desk. Retail prices total $22,231, but friends of KNOM in the broadcast equipment business have significantly discounted our price to $14,498. We have already been given a single gift of $5,500 toward this project, and still need a total of $8,998 to build this editing station. Can you help? · July 30th, Nome’s St. Joseph’s Parish is conducting a Jubilee Year pilgrimage to the extremely remote former Jesuit orphanage at Pilgrim Hot Springs. The pilgrimage includes celebration of the Mass in the former mission’s boarded-up chapel, about 50 miles north of Nome. To broadcast this Mass throughout western Alaska, we need to lease a satellite telephone, plus satellite time, totalling about $2,900. Will you help us broadcast this historic Jubilee Year Mass? north side of 1,200-foot Anvil Mountain. Six miles north of Nome, Les is a stone’s throw above the creek where Nome’s first gold was discovered in 1898. 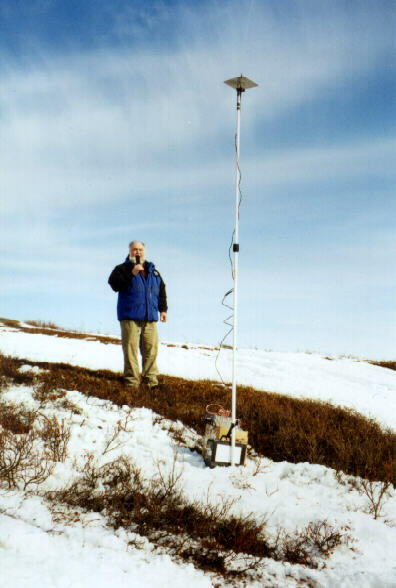 In front of Les, a 15-watt transmitter beams his signal to the studio, using a car battery for power, and an antenna mounted on top of a painter’s pole stuck into the snow. 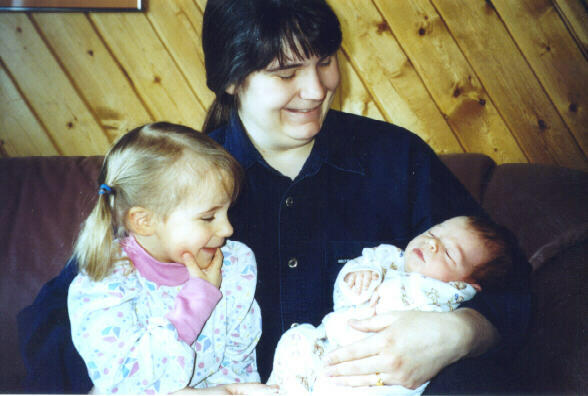 Florence Busch, who took this photo, provided logistical support. 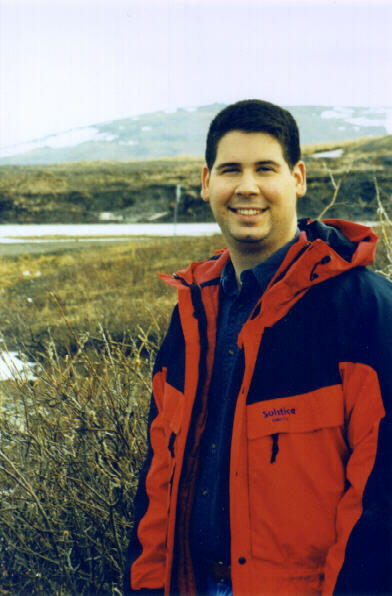 From Studio A, Tom Busch produced coverage, blending reports from Paul Korchin and Matt Christy at the start/finish line on the Bering Sea ice; Mike Nurse, at the Snake River, and roving reporters Victoria and Kelly Brabec. Our coverage of events like this brightens spirits in springtime, a season that once was chiefly associated with depression and suicide. INSPIRATIONAL SPOT: We are most like beasts when we kill. TOWERING ISSUES: KNOM’s 230-foot tower turns thirty this year. To our knowledge, it’s the second-oldest guyed tower in Alaska. The steel tower itself appears to be okay, although the guy cables may need to be replaced soon. One worry is that its concrete base is slowly tilting as it melts into the permafrost. Another concern is that due to its age, the tower requires professional annual inspection. We are considering the possibility that in the long term, it might cost less to build a new tower on a new foundation, than to continue to maintain the old one. Fortunately, we have time to make a decision, perhaps as long as two or three years. While a decision won’t be needed for some time, we wanted to call this “towering” issue to your attention. Once more, we sincerely thank you for your kind support for our mission. This important work is made possible by many of us working together. As we approach the time of the Midnight Sun, we offer a special prayer for your help. May summertime be safe for all those whom you love, and may it bring all of us God’s peace, and the resolve to do everything within our power to serve His children. God bless you!